With our impending move back to the south on my mind, I've been spending a lot of time climbing around my paternal grandmother's side of my family tree. I should have done a lot more of that when we lived in North Carolina (or, you know, ever) but I've always just thought of my grandmother's line as being from Florida so I didn't really think of it. But before they were from Florida they were from Georgia and before they were from Georgia they were from North Carolina (and before that they were from Germany/France/Ireland/England). There are a lot of dead ends in my grandma's line; even the names that I do have are faceless, story-less figures. I wish I knew more about them, but I fear they will forever remain a mystery. My great-great-grandfather, Charles (Patty) O'Neal, stole away across the ocean on a ship. There is no record of his transit, but on census reports he has claimed to have immigrated from France. Our family stories say he is from Ireland (and I don't doubt that's what he told people) but his other family (scalawag up and abandoned my great-great-grandmother shortly after childbirth) believes he is French. So who knows about him? Mary Duggar (my great-great-grandmother, who was married to Mr. O'Neal) has a much more significant family tree (and by significant I mean...it exists (there is a record of it) whereas Charles O'Neal left us no clues about his family line). That said, her line soon fizzles out as well. I spent a lot of time looking at the Futch line because, well, that's the one that is there, but even that one leaves a lot of questions. It isn't the best picture, but we finally got a picture of our family in front of the Christmas tree. 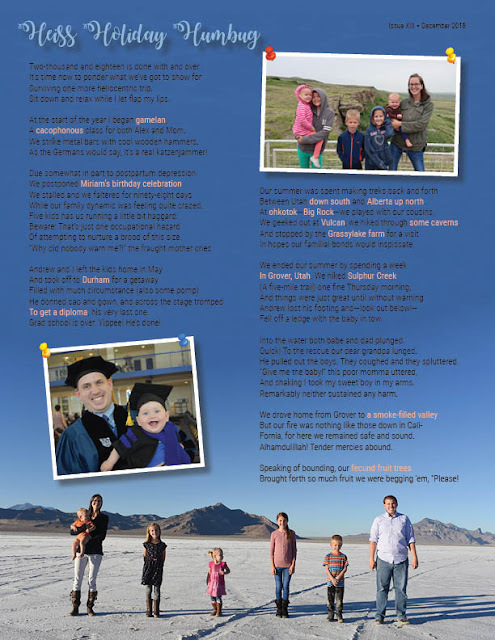 Just in time for the New Year, which will bring a lot of changes for our family. My parents treated our family to a trip to the movies this afternoon. We haven't all been to the movies since the very beginning of the year when we accidentally had the kids skip school so that we could go to Coco. That's because going to the movies as a family is both (a) expensive and (b) hard. Actually, the four oldest kids were all super well behaved. It was just Alexander being a handful—and, boy, was he ever a handful! I watched 95% of the movie from the little entrance hallway thing, which was fine. After 2+ hours of wrangling Alexander, however, I was about wiped out! We saw the new Mary Poppins movie, which was charming. In Durham we once checked out all of P. L. Travers' Mary Poppins books and I read them out loud to the children. I think it was because we had watched Saving Mr. Banks and then because of that we introduced the kids to Mary Poppins, both on the screen and on the page. It was fun background knowledge to have because I could say (to myself, and later to Andrew), "Yes, yes. The bowl incident. That happened in one of the books." A lot of things in the movie happened also in the books, which was nice. And it was nice that it wasn't simply a scene-by-scene remake of the original Mary Poppins but was, instead, a continuation of the story (similar to how the books work) with new music and adventures. I think we all enjoyed it, though I may have enjoyed it more if Alexander had truly been free to crawl around and make a nuisance of himself (he was determined that we would not sit in our seats). After the movie we headed over to my parents' house for a pizza dinner and the kids had fun exploring the big box of stuffed animals in the basement (mostly Josie's (though the troll is mine—haha)). When we got home, as if we hadn't had our fill of screen time, Andrew and the three oldest kids watched Two Towers while I put babies to bed and then looked at houses. I have no idea how to buy a house, guys, and it's kind of stressing me out. Our friends James and April lent us their baby's Halloween costume so that we could dress Alexander up like Jack Jack for Auntie Josie. 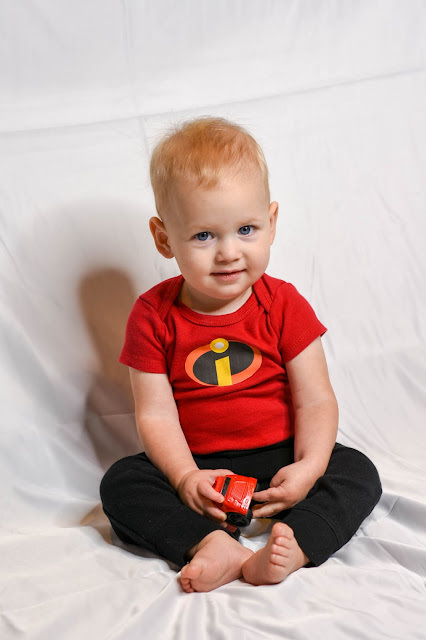 So we put him in the costume (finally) and snapped a few pictures, but he wasn't feeling very Jack-Jack-like when we took the pictures and just sat there and stared at us. He hasn't been feeling 100% so that's probably why he was exuding a lack of energy he entire photo shoot. Christmas Adam we had sacrament meeting at church, and that is all, which felt odd. We came home wanting lunch even though it was only 10:00 in the morning. Rachel and I sang with the choir and everything felt bland. The way that we are—this numbness—is a coping mechanism, I think, because the alternative to not feeling anything is feeling everything. So I sang the songs and I felt very little until I looked down and saw a sister in our ward openly bawling and then everything inside of me broke, too, and I spent the last little bit of the song mouthing the words instead of singing them because I was crying. 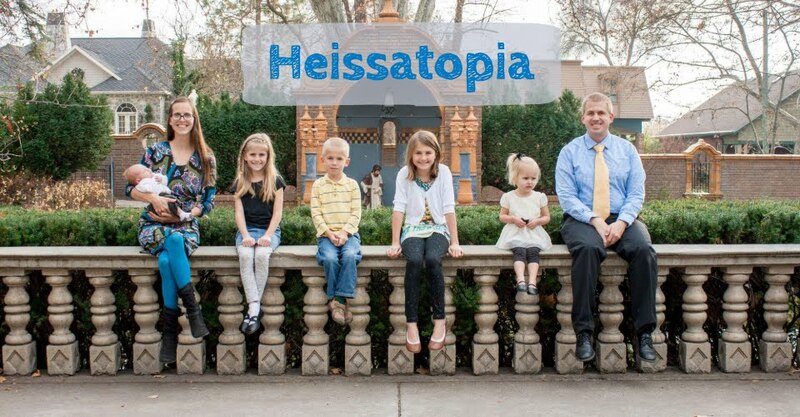 A couple in the ward adopted two little girls from Ukraine, so I went up to talk with them. They speak no English and seemed rather relieved to speak with someone who could communicate with them a little easier. In the evening my friend Gulnaz (who is from Russia) brought dinner to their family and the girls and I met her at their house to sing В лесу родилась ёлочка to the girls. They seemed to really enjoy it; we were happy to give them a little bit of the familiar to them when their life is rather turned upside down. My sister and mom came over for latkes and stew, prepared by Andrew, and then we watched The Muppet Christmas Carol, which Zoë found enrapturing. She was terrified and mesmerized in all the right places. Afterwards we gathered around the piano/organ for some singing. 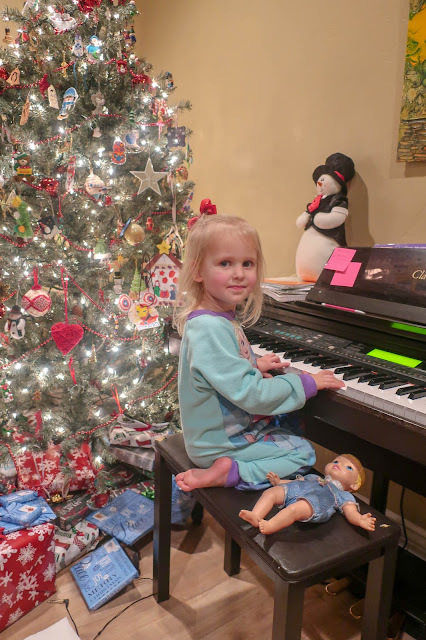 We sang a few carols that Miriam played and then entertained Zoë by singing whatever words she told us to (to the tune of Twinkle, Twinkle Little Star) while she played nonsense on the piano. "Sing, 'Alex, no! Alex, no!'" she'd demand. "Now sing, "Mommy, yes! Mommy, yes!'" We thought we'd beat the Christmas rush—or, rather, out-wait the Christmas rush—by heading to Temple Square on Boxing Day. Alas, we seemed to hit Temple Square with all the other procrastinators because Temple Square was packed. It took us about ten minutes just to use the elevator at the parking garage, which should have been a sign, and we were shuffling through crowds the whole night! When we finally made it off the elevator, which spat us off in the middle of the mall, we ran into our friends—the Enslows—from our Durham days! That was fun! They live in Idaho now but were down for Christmas (obviously). How funny to bump into them at Temple Square (I realize the world is small and the world within the church especially so, but still). 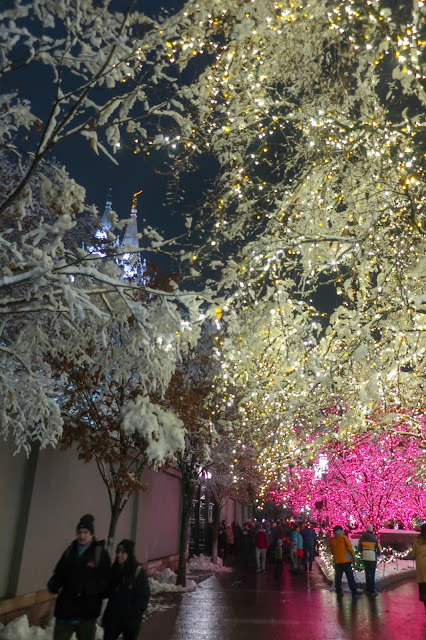 Although our Christmas was dry as a bone—with not a flake of snow in sight (Zoë declared her Christmas "ruined" at dinner because it wasn't a white Christmas—we woke up to a winter wonderland this morning, so the trees at Temple Square were covered in both lights and snow and it was dazzling. Rather, Christmas has come and Christmas has past It's the stories of Christmas that will soon be coming. 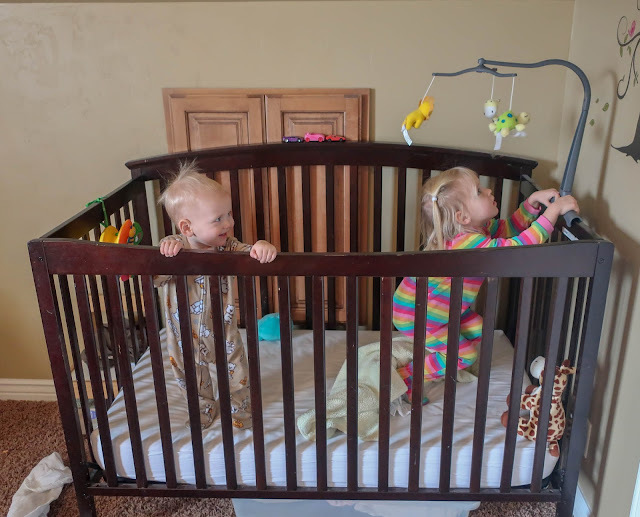 For now, enjoy these pictures of my babies playing together in the crib. Zoë has been climbing into the crib with Alexander forever so it's not entirely surprising to see them both in there. This particular day, however, I know that when I left them they were outside of the crib, which means that somehow Zoë got Alexander into the crib. I'm not sure I want to know how they accomplished that feat. We don't do Christmas jammies. In fact, my children tend to choose their most hideous bedclothes to wear to bed on Christmas Eve so that when we open gifts in the morning they look downright terrifying (the hideous bedclothes, of course, being accompanied by some wicked bedhead). Similar to the idea of coordinating Halloween costumes, the idea of coordinating pyjamas—for the entire family—seems entirely outside my sphere of control. Sometimes, from the look of social media (and this is when social media turns into a bad thing, I guess, because I shouldn't be comparing traditions but literally every post in my entire feed is about Christmas pyjamas). I feel like we're maybe missing out on something. But how am I supposed to (a) convince the entire family to wear the same style of pyjama or (b) surprise everyone with cute pyjamas to wear that they'll each be thrilled to pieces about wearing? How do families pull this trick off? Guaranteed if I tried it the results would be disastrous. Someone would cry or refuse to wear their pyjamas—probably both. Also, someone would manage to stain their pyjamas before I would manage to take the coveted Christmas Pyjama Picture. I'm fine with that usually. I mean, they're pyjamas, which don't really matter at all until it's pyjama day at school and you realize all your tween ever wears to bed are Grandma's old t-shirts. Those aren't so cute to wear to school...sorry about that, Rachel. As my mom and I were wrapping up a conversation this evening she said, "I'd better let you go so you can blog so I can read it in the morning." No pressure. We didn't do much today. Some grocery shopping, some ornament making, some movie watching, some napping. I am feeling a lot better today, though I fear we'll spend the rest of the break passing this virus around. Alexander is running a fever now and several other children went to bed complaining of feeling ill. While we were watching (and painting, for those of us without the attention span for Lord of the Rings), the doorbell rang. We opened it to discover three big boxes filled to bursting with presents. A little sleuthing revealed—or very nearly revealed—our benefactors (who still remain very much anonymous but at the very least we can thank the organization who played Santa to us). Andrew and I numbly unloaded the boxes, filling the empty cavity below our tree. Everything seems a little numb and empty these days. 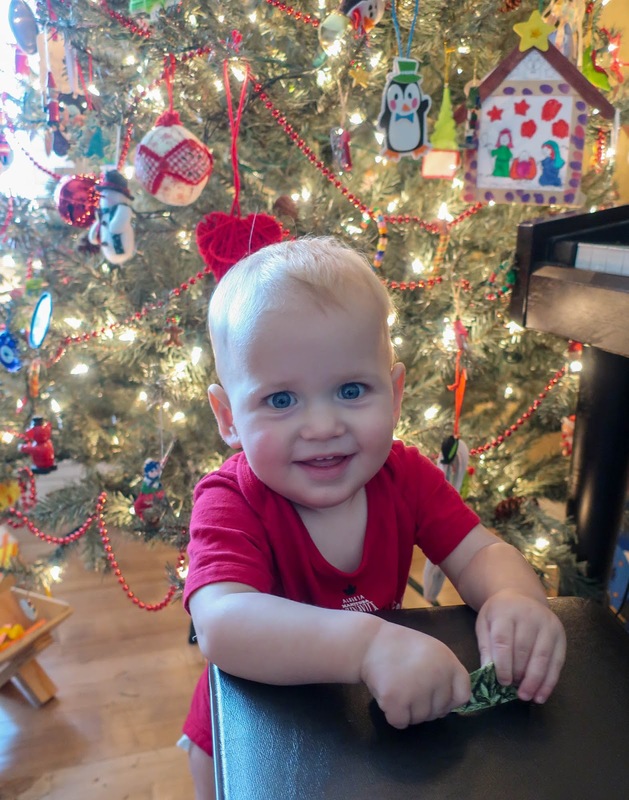 It's not that we weren't grateful for the gifts; we were (and I'm sure it will be fun to see the children's faces on Christmas morning (in fact, maybe even tomorrow morning because none of them noticed any gifts appear under the tree)), but emotions are complicated and messy. We didn't need Christmas delivered to our door, not in the physical sense. We aren't lacking financially (finally; and it's a wonderful feeling!) and we've got Christmas presents stowed away waiting to be wrapped. There are others who could have used these gifts more than we could, in that sense. But our house feels poor in another sense—in the lonely, heartache, missing-something (missing someone) sense—and if a few toys can cause a ray of Christmas joy to break through our pall, then I suppose it will have been well worth it. So we didn't need this. But we did. We went out for our anniversary last night (to the Payson temple to do an endowment session and then to dinner at Cubby's) even though we're still both a little under the weather. While we were out I mentioned a time long ago when someone warned us that we would regret getting married so close to finals week, but we scoffed at them. That would surely only matter until we were finished with our degrees (which I was and which Andrew had immediate plans to finish) and then we'd be free and clear. Thirteen meandering years later (hi there, grad school) and we're still running into issues with our anniversary and finals week (and probably will forevermore). And I'm pretty okay with that. What I'm less okay with is how often we're sick on our anniversary. 'Tis the season, I guess. While I was mostly alright before we went to the temple, I started sneezing at the temple. And things went downhill from there (which was annoying because I thought I was getting better, not worse). I was a drippy, drippy mess by the time we got home, but I still felt alright. By the time we went to bed, however, I did not feel alright at all. I could not get warm. Eventually I fell asleep, however, and by the time I woke up at 4:00 in the morning (thanks, Alexander) I was downright miserable. I had a raging fever and could hardly get out of bed. After I nursed the baby I messaged a few people to find a substitute for Benjamin's class party today (which I really didn't want to miss but...oh, well). And then I went back to bed. Andrew took Miriam to her orthodontist appointment and Rachel to her orchestra party early in the morning. I got Benjamin off to school and then once Andrew was home went back to bed (for, like, four hours). I slept more in the afternoon. Good thing I had so many helpers at home today! (Andrew didn't go into campus and the kids got out of school at noon). At dinner time I said to Andrew, "You know what the dumbest part is? I don't even really feel sick. I mean, besides the fever and the headache and the runny nose and the full body ache and the burning eyes, I don't even feel sick!" "Okay. You literally just described sickness," he said. "That's like saying we don't have any kids—besides Rachel, Miriam, Benjamin, Zoë, and Alexander. But, I mean, other than that we have absolutely no kids." But I'm hoping to feel better soon because I'd really like to do something fun with the kids during their ridiculously short Christmas break (Atlanta's school district appears to get a full two weeks off, which I'm looking forward to because I obviously haven't been able to wrap my head around this one-week of Christmas break thing (we sure do miss the year-round calendar)). 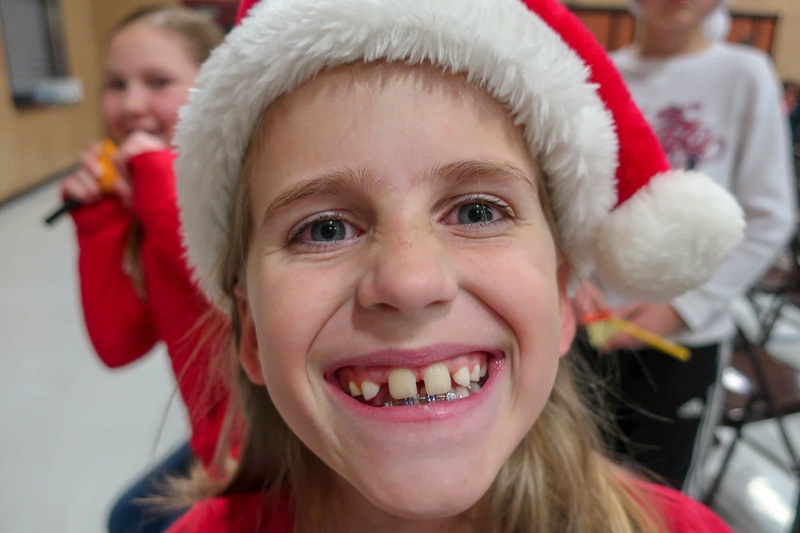 On Monday morning the little ones and I went to the elementary school for "Sing Around the Tree." 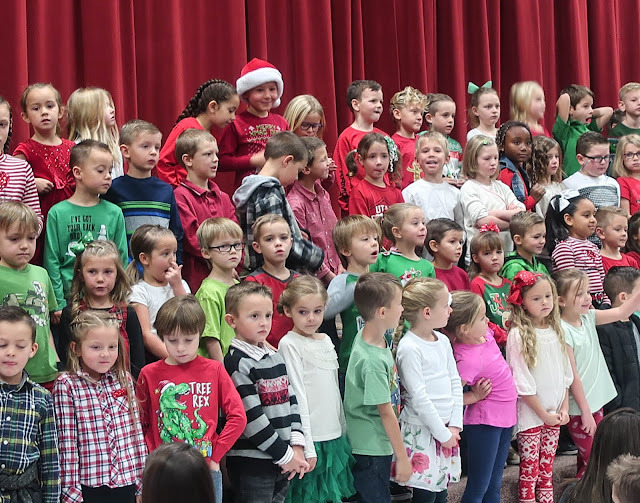 Each grade files into the auditorium to sing their parents one song before filing back out again, so some parents (like me) needed to be there from start to finish. Others only needed to be there for a couple of songs at the beginning or a couple of songs at the end. And the gym is somehow always packed. Last year we were running late and were lucky to get a seat at the very back of the auditorium (after a few families had left). We were still standing in the hallway when Benjamin's class finished singing! 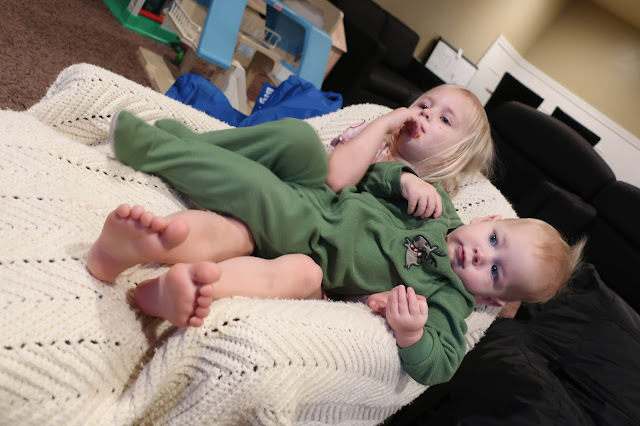 And—boy!—was I ever grateful for that chair by the time I snagged one (I had a new baby and a toddler with me; and the chair I found just happened to be beside my friend Necia, who pulled Zoë onto her lap for a snuggle). 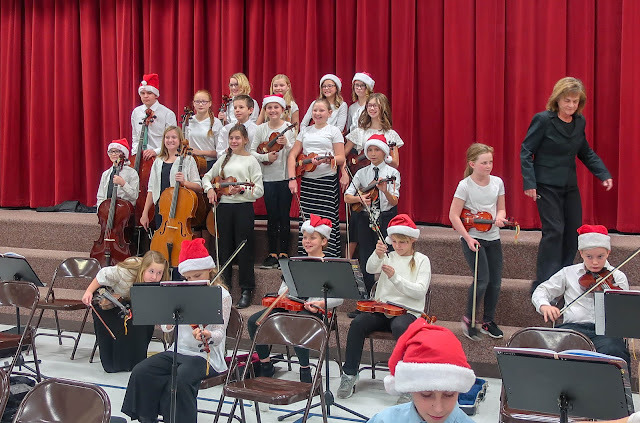 I just skimmed through a diatribe of a blog post a friend shared about how rude it is of parents to leave a concert after their child has finished performing, and I suppose it technically isn't good concert etiquette, but I'm totally cool it when it comes to an elementary showcase. Parents whose children are in the older grades know to show up a little late if they can't commit to a whole hour of singing time and parents whose children are in the younger grades know to be there early if they want a good seat. Allowing the audience to ebb and flow like this means that even if you were at the very back of the gym (or the hallway) for your first child's song, you might have a decent seat by your oldest child's song. I see no need to shame parents for leaving early (or arriving late, as the author of the blog admits to having done in the first place (which is equally rude)), but you're also free to stay for the whole concert if you want to. I'm cool with that, too. I love Christmas music! And this particular concert is a pretty relaxed atmosphere. Benjamin's in grade one this year so his class was very near the beginning. I could see him staring out into the sea of faces, trying to find mine. "I can't see my mom!" he mouthed to his friend Holly (aptly named for this occasion). I stood up and waved to him and his face lit up (sometimes being a mom is glamorous). Emily came down again this Friday. We're beginning to joke that Fridays are just our day with her—she's been down so much the past couple of months! I'm sure she's getting sick of making the drive, but we do love seeing her. 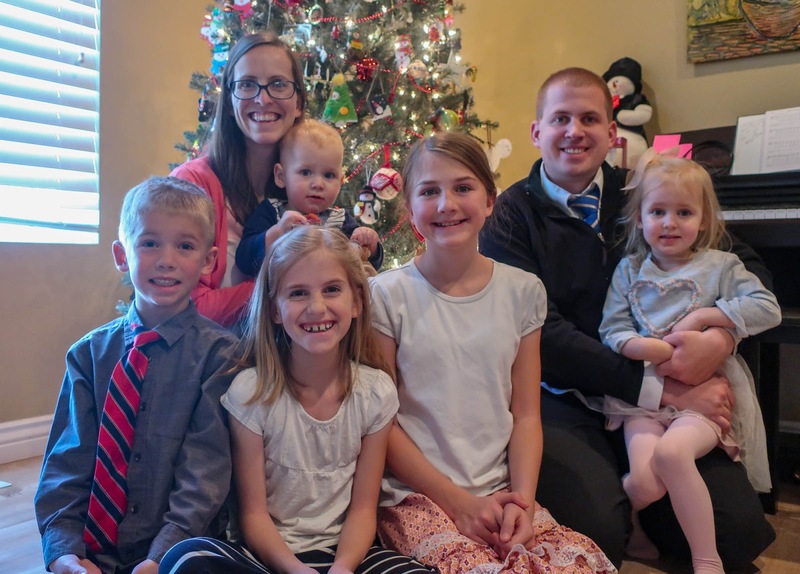 This time her sweet family came down to attend her sister-in-law's wedding so they were only at our house overnight, but it was fun to get a little bit of cousin time in. 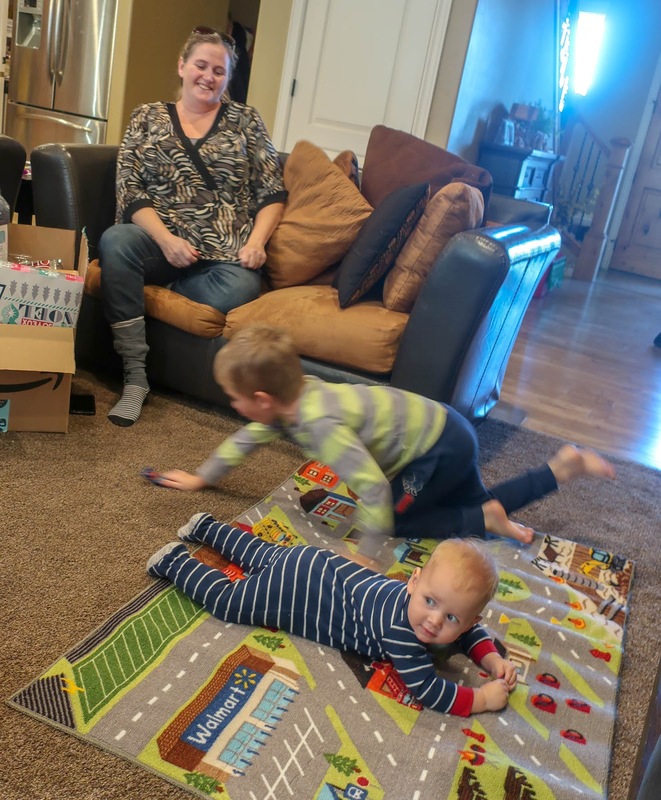 On Saturday my sister Kelli stopped by with Christmas presents for my kids. She is such a good gifter (I am not good at giving presents and have to work really hard at it, but it just seems to come naturally to her). She got Alexander a car mat and when she laid it out on the floor him and said, "This is for you!" he crawled over as fast as he could and then threw himself down on the carpet where he stayed happily for quite some time. It was pretty funny. I mostly finished this poem and then sat and waited, wondering whether or not we'd hear back from Georgia (or Italy, but that's another story) in time to include it in the newsletter. Finally we decided to publish it without knowing (after all, we've ended every other poem with a big ol' question mark about our future) but as soon as we'd decided that we got the call from Georgia offering us a position! So then I decided to work it into the newsletter after all, which meant I had to wait another week while the offer was finalized. Andrew signed all the paperwork yesterday so it's officially official—we'll be moving to Georgia next year (after we finish up the school year here)! Hold onto your hats, folks, because this poem ended up being significantly longer than in years past. It's been a doozy of a year, though, so that's completely justifiable (right?). Several weeks ago, back when we were planning on going to Mexico with Grandma and Grandpa for Christmas (a humanitarian trip), Rachel and Miriam started working on "knifty knitter" hats to take with us so they could give them away. Seeing the girls work on their hats (which I don't think either of them have finished because life got crazy) reminded Grandma of a little set of kitting looms she once was working on. She also hadn't finished her project—a scarf—which she started before she got married and then spent the next 3+ decades carting around! She did, however, know right where her looms were, so she got them out and told the girls they were welcome to try to finish the scarf she'd started and could have the looms. And then she died. Continuing her project seemed too daunting to the girls so I decided I would take it up. After all, I was the one to finish the baby blanket Grandma Sharon had been working on (for Gavin, I believe) before she passed away. I probably didn't finish it quite like she would have, but I studied it and figured out what pattern I thought she was using and finished it off. 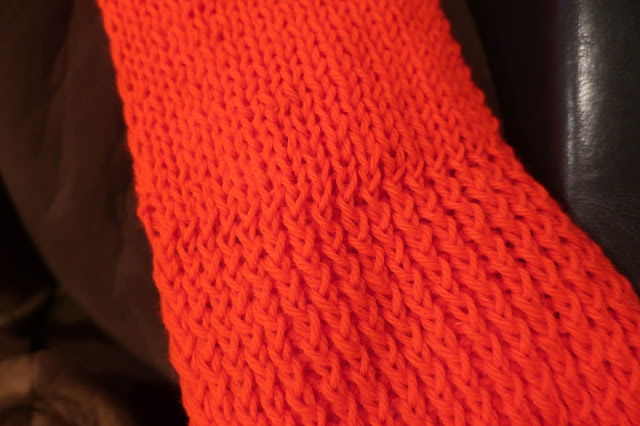 To finish Grandma's scarf I had to watch a little tutorial and then use a little trial and error (I'd only ever worked a loom in the round before) and by the time I was getting the hang of things I noticed that my stitches didn't match Karen's stitches at all! My stitches are on the top, Karen's stitches are on the bottom. You can definitely tell where one woman left off in the 1980s and the other began in 2018! We hosted dinner this evening for the family that Andrew and Reid minister to (because they're ministering companions now; also Andrew was called to replace his mom as organist today and he's super excited about it) and just as we'd gathered everyone around the table Benjamin thought he'd address the elephant in the room. He loudly proclaimed, "OUR GRANDMA IS DEAD!!" "Welcome to our happy home," I apologized with a forced smile.
" Don't worry," Brother O. responded to Benjamin, in an equally jovial manner. "So is mine. In fact, both of my grandmas are dead." As far as ice breakers go, I guess this wasn't a bad one. At any rate, the only way the conversation could go from there was up, so we'll consider it a win! 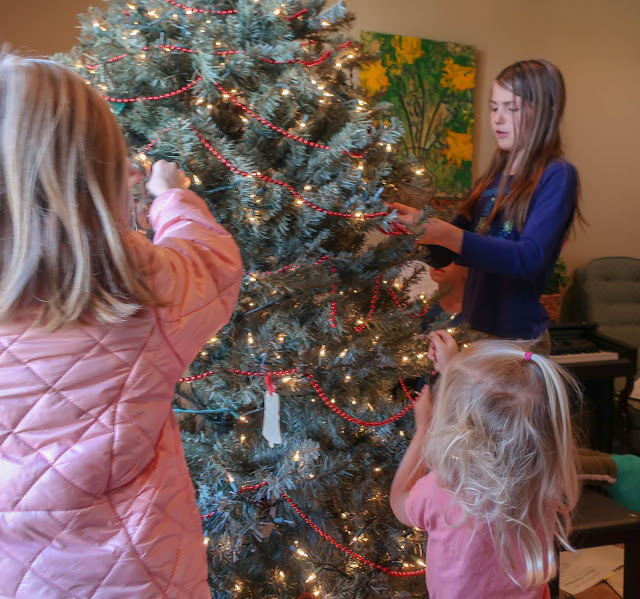 Christmas preparations are in full swing at our house. Whatever that means. It certainly feels more like going through the motions of getting ready for Christmas than anything else. I hope the children are at least feeling some spark of magic and anticipation because the grown ups are all feeling rather...meh. 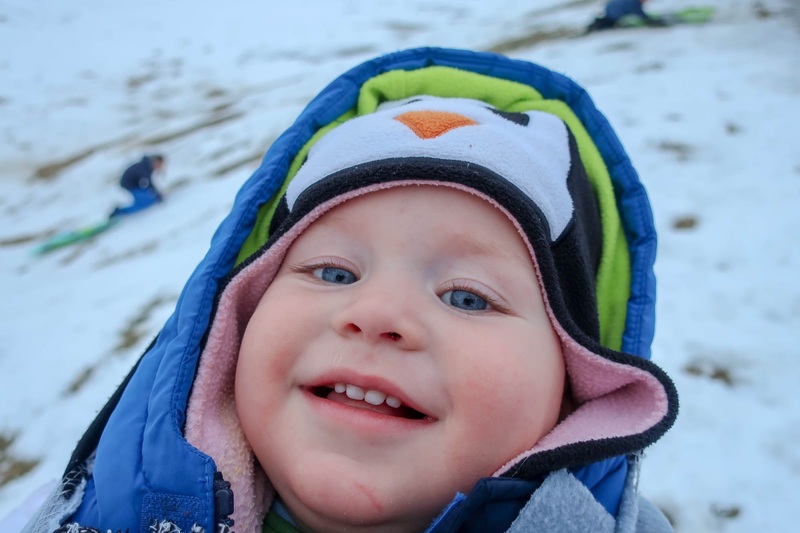 Today is my dad's birthday as well as the day Alexander turns 14 months old! This evening was Rachel's first orchestra concert. She's really been enjoying orchestra this past semester, was thrilled at the challenge of learning a new clef, and even willingly practices! Here she is before her concert with most of her school's orchestra. Her teacher works with more than one elementary school and this was a combined concert. Rachel was a little nervous to play with an entire orchestra she'd never played with before, but they all did just fine. Miriam's organ recital was on Tuesday and she pulled quite the crowd! Aunt Linda drove up to BYU with us (okay—she drove up to BYU for us, which was so nice of her) and we met Auntie Josie, Naanii, and Uncle Bruce on campus. The kids wanted to sit on the very front row and we ended up filling it more than capacity. With Alexander on my lap and Zoë on Auntie Josie's we just barely fit (the front row was an accessible row, so there were gaps left in the row to accommodate wheelchairs; we didn't take up a whole row, just the whole section of chairs). And then I remembered that Andrew would be coming, too, so we ended up being very squished in our section. He taught a class from 4–4:50 on Tuesdays this semester so he was running a little behind schedule. We even held off starting the concert until he arrived since Miriam was, once again, the first player (because she's the only one short enough to require the pedal extender they had it ready to go for her and then removed it for the rest of the kids to play). 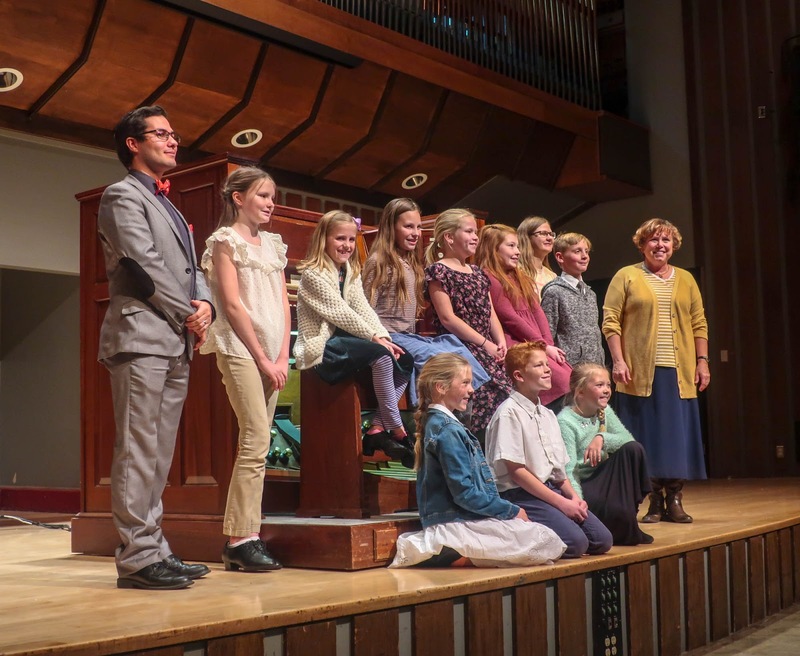 Here's the very first Organ First class together on the stage (except for Miriam's friend Annaliese who wasn't able to be there and who is also short enough to need the pedal extender (so was slated to play second)). This week shall hereby be known as The Week of Concerts. Last night we had our stake Christmas choir concert. My mom and Josie came to watch it with us and—surprise!—participate with us. We sang a beautiful arrangement of What Child is This? by Dave Fackrell and somehow I ended up being one of two altos in the choir which made me feel incredibly nervous. I'm a somewhat timid alto because I always sang soprano when I was younger. But I enjoy the challenge of learning the other parts, and besides...somebody's got to do it. Never have I been in a ward choir with such a dearth of altos! The only other alto wasn't sure she would be able to make and told me that if she could she would definitely be late. You can imagine my horror when I looked at the program and saw that we were the very first number (that's what we get for being in the 1st ward)! So I asked my mom if she'd go up with me and then gave her a quick tutorial on the music, humming it quietly in our pew, before we went up to sing. The other alto did, in fact, make it. Andrew said she walked in right before we went up. Phew! So we had three altos to fourteen soporanos and I don't even know how many men (our choir has been oddly heavy in the bass clef recently, which is a wonderful problem to have). Those were much better odds. I should add that we also had Rachel with us. She's been learning to sing alto as well, though she (self-admittedly) tends to flit back to the melody if she's not careful. It does take some ear training to get used to singing a different part. Anyway, it went well and I was grateful for my mom's support (for coming and for singing) and for Josie for watching the little ones on our bench and for Andrew for pacing the halls with a screaming Alexander while our choir was up. This evening was Miriam's school choir concert. The kids' meals came out promptly but the food for the grown ups took forever because somehow between filling the order for the kids' meals and finally filling the order for our meals, our "ticket got lost" so they just didn't ever make our food. ** We waited for about an hour after the kids ate. 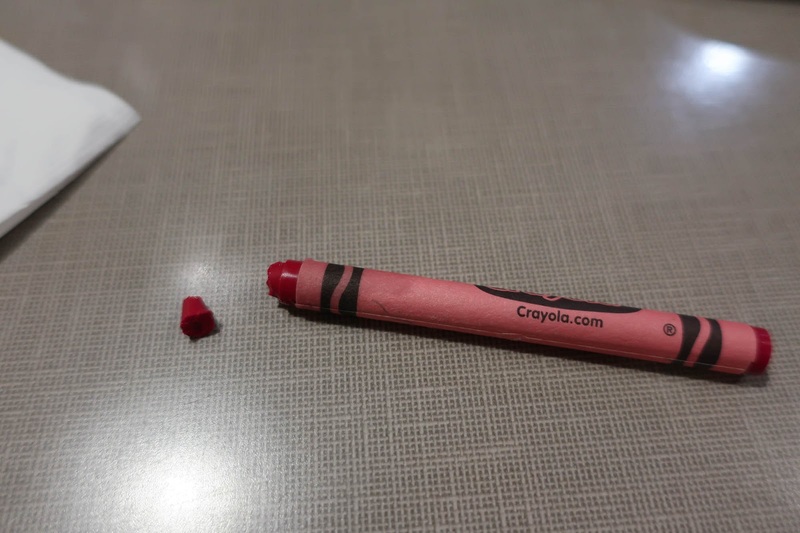 Alexander was getting so hungry that he started eating crayons. Trigger warning: This post discusses a recent suicide attempt on BYU campus. "Thank goodness November is over! That was an awful month. December," Andrew declared, "will be calm and relaxing and normal. We've got this." And with that he finished scraping off his car (because although he declared December calm, relaxing, and normal he couldn't exactly put a moratorium on the cold) and headed off into the world for the first workday of December. I was surprised, about twenty minutes later, when I heard the garage door open. "Forgot this!" he said, picking up his briefcase and waving it in the air. "So much for a good start to December. I'm supposed to meet with a student in ten minutes but I'm definitely going to be late for that appointment!" And with that he was off again, chuckling to himself about how he had been the one to upset the calm, relaxing, normal beginning to December. Little did we know, a calm, relaxing, normal December was not at all in the cards.